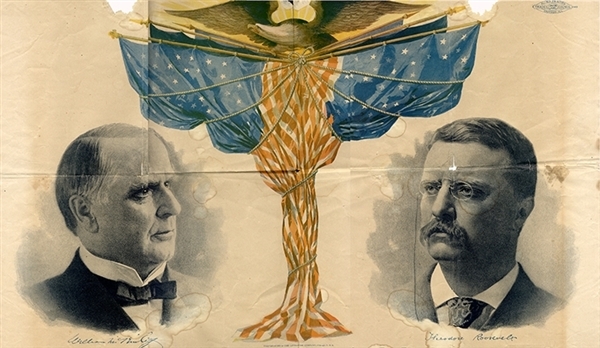 Poster, 27’ x 18,” a rare 1900 campaign poster featuring William McKinley & Theodore Roosevelt. Colors are sharp and the poster shows some minor wrinkles. Printed at the bottom of the flag are "Copyright 1900 by Lithotone Company Chicago, U.S.A." The Bottom of the poster reads PROTECTION * PROSPERITY * NO LOWERING OF THE FLAG * RIGHT AND JUSTICE * HONEST MONEY * FULL DINNER PAILS * OUR COUNTRY * OUR HOMES. Poster does have paper loss in three places on the top margin not affecting image, and occasional water staining, about good.